An international workshop on Elementary Excitations and Fluctuations in Magnetic Systems was held in San Miniato, Italy, for five days beginning 28 May, 1984. The workshop comprised eight working sessions that contai- ned a total of 43 invited talks, and 58 scientists were in attendance from 14 countries. Our aim was to review some topics of current interest in the statistical physics of magnetic materials and models, with an emphasis on theoretical studies and confrontations between these and experimental and computer simulation data. 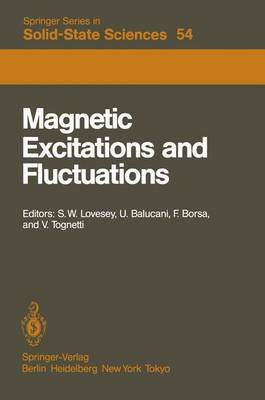 book contains summary papers written by the invited speakers, and This the material will be of immediate interest to graduate students and resear- chers engaged in studies of magnetic properties. There is, perhaps, no ef- fective way to record and convey the benefit of the numerous discussions between the participants that are a significant integral feature of a work- shop. The magnificent .venue of the workshop, I Cappuccini, was made availa- ble to us by the.Cassa di Risparmio San Miniato. Financial support for the workshop was received from Consiglio Nazionale delle Ricerche, Universita degli Studi di Firenze and the Gruppo Nazionale Struttura,della Materia. Our administrative load and the burden of preparing the proceedings for publication was made light by the talents of Carla Pardini (CNR, Florence), and Caroline Monypenny and Jane Warren (Rutherford Appleton Laboratory). Fina 11y, we wish to thank all the participants for their attendance and individual contributions to the success of the workshop.